Firstly can I just say it was an absolute pleasure to sail at the 2017 UK RS Aero Nationals earlier this month at Hayling Island Sailing Club and one of the best weeks sailing of my life. Not only did we have great weather with plenty of sun and wind but the class was incredibly friendly, welcoming and fun. I met lots of new people and really look forward to sailing at more Aero events in the future. I learnt so much from the Aero nationals and I thought it would be nice to write up my top tips and give something back to the class. I hope you find them interesting and maybe even learn a thing or two! Having a great time on the water is always an essential! On Day 1 and 2 of the championship we experienced light to medium winds ranging from 5 - 12 knots and I thought that in these wind speeds your mainsheet trim was critical if you wanted to sail fast and point high on the upwind legs. On the Aero the mainsheet changes the sail shape dramatically and can reduce/induce depth very easily and on Day 1 and 2 I thought if you played the mainsheet on the upwind legs you could be very fast and point high at the same time as long as you had the rig setup correctly (see next section). My technique I was employing was in the light spots was to ease about a foot of main and then in the gusts I would squeeze the mainsheet back in a foot or so depending on the strength of the gust. With the mainsheet squeezed in you could sail higher (watch your tell tales carefully here!) and as soon as you hit a lull you would ease the main slightly and bear away a little which at least kept your speed through the water. In the two pictures below, by looking at the angle of the boom, you can clearly see the two differences between sailing in a lull and in a gust. Looking at the angle of the boom, we can clearly see I have eased the main slightly and must be in a lull. Note the slack kicker, deep outhaul and no downhaul on at all. Here we can clearly see I am sheeted in more than the previous photo so must be in a gust, pointing higher whilst sailing fast. Notice the creases in my sail - more on that in the below Downhaul section. 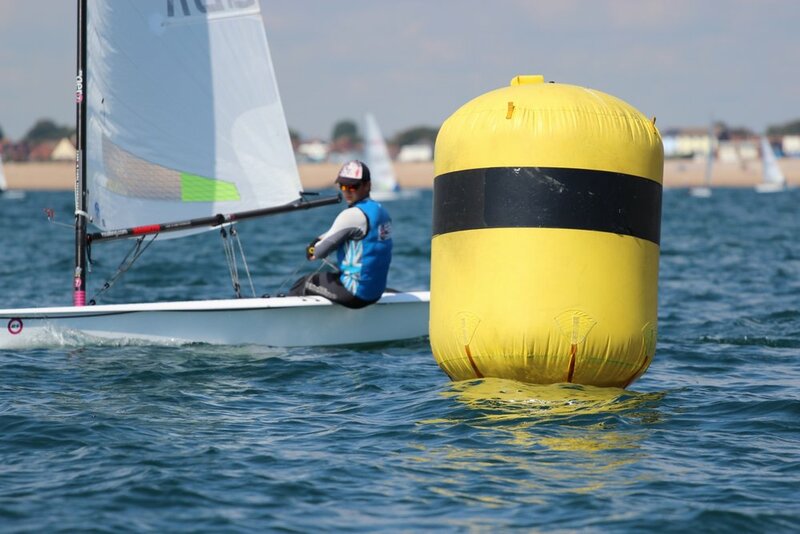 So by sheeting the main in and out and changing my upwind sailing angle very slightly I found I had a fast sailing mode in the lulls and the gusts, a powerful combination on the race course. In the light 5-10 knots going upwind I had a medium tension kicker setting (usually pulling around 40cm through the deck cleat), no tension at all on downhaul (more on that in the section below) and a surprisingly loose outhaul (usually a hand length and a half. Some might say this was too deep but being one of the bigger guys in the fleet I found it allowed me to point higher and it just felt 'good'). Downwind I kept the downhaul off completely, left the outhaul the same one and a half hand length deep but released the kicker off all the way (I quite liked a loose leech which felt great sailing by the lee). Fully hiking weather + a bit more = depowering time. In the 15 knot gusts you wanted to be depowered but in the 10 knot lulls you killed your height and speed if you depowered too much. Combined with the difficult Hayling chop and that threw up some challenges. I found that a tight kicker (approx. 60cm through deck cleat), a outhaul approximately a hand length deep and a light-medium downhaul setting worked well. On the upwinds I was keeping the mainsheet pinned in but actively playing the downhaul, releasing in the lulls and tightening in the gusts. Downwind I released the downhaul completely, let the outhaul off to be one and a half hand lengths deep and released the kicker about 45cm so that it wasn't too loose whilst surfing waves. I found that at these winds upwind I was fully depowering so I had max kicker on, a hand length deep outhaul when I wanted to point high, flattening off to half of that when I wanted to go low and fast, and a lot of downhaul on. The more overpowered you are the harder you pull the downhaul and kicker on! Other than that hike hard, move back in the hiking strap slightly and keep the boat flat and it feels like you can get the boat planing upwind. Very fun. Downwind I released the downhaul and kicker a lot and if it wasn't too hairy the outhaul would come off too! Now it could of been my sail specifically but in the lighter winds I was finding my sail got quite a few diagonal creases when sheeted on in an upwind setting. This might be due to the elastic bolt rope, but I'm not sure. Whilst it was very tempting to pull the downhaul on to remove them, if you watch the leech I found it was changing the whole sail shape and opening the leech, something you don't want and was making me not point as high. Obviously I didn't want this so I left my downhaul off and ignored the creases, which seemed to work well. Note all the diagonal creases in the sail. My top strategic tip from the nationals was definitely SAIL IN MORE WIND. If you're simply in more wind than someone else it will be very difficult to go slower than them. Sounds simple right? Unfortunately it is not that easy. The first thing I would recommend is trying to learn how to sail your Aero by feel and so if you look away for 5-10 seconds you can maintain a perfect course. As the picture below shows, the majority of the time whether going upwind, downwind or reaching I was constantly looking upwind to see where more wind is and where it will be in 30 seconds etc. The more time you can spend spotting gusts, the more gusts you will find and therefore probably the faster you will go. Free, effortless speed. Here you can see me really looking upwind trying to find where the most wind is, where it will be and how I can best make use of it as I approach the windward mark. So what physically was different between every Aero and would of made life easier/faster? Well I made a few changes to my charter boat but it was by no means perfect. The first change I made was to fit a thinner, 6mm mainsheet. I prefer the feel and how smoothly it runs. It was a dream to use in the lighter winds. I then fitted a masthead wind indicator which was very useful for sailing downwind as well as a wind indicator at the bottom of the mast just for reference. I tied a slip knot in the main halyard, tied some elastic to that and led it down the boat to the downhaul block. This was used to pull the downhaul off when I released it, especially useful if you don't have over-deck controls. I also tied elastic to the outhaul block and round the boom gooseneck to pull the outhaul off when released. I tightened the top batten tension on day 2 by approximately 6 turns, leading to a more hooked sail. Felt good. I flipped my boat over and gave my boat a thorough wash and clean. You'd be amazed how much grime, sand and dirt sticks to the hull even when wet so I would recommend doing this as often as possible! Quite a few boats had over-deck control lines. These looked very cool, seemed to work a lot better and I was very jealous that my charter boat didn't have them! I have fitted a Rooster over-deck controls kit recently to another Aero at my home club and found it to be very high quality and simple to do with a nice video to guide you along the way. Other than that my boat was a standard RS Aero charter boat, kindly supplied by RS (thanks guys!). Simply put, if you get a good start and sail fast in the strategically right direction you will win the race! Its the small things which put together make a big difference. I hope you have enjoyed reading this article as much as I have writing it! 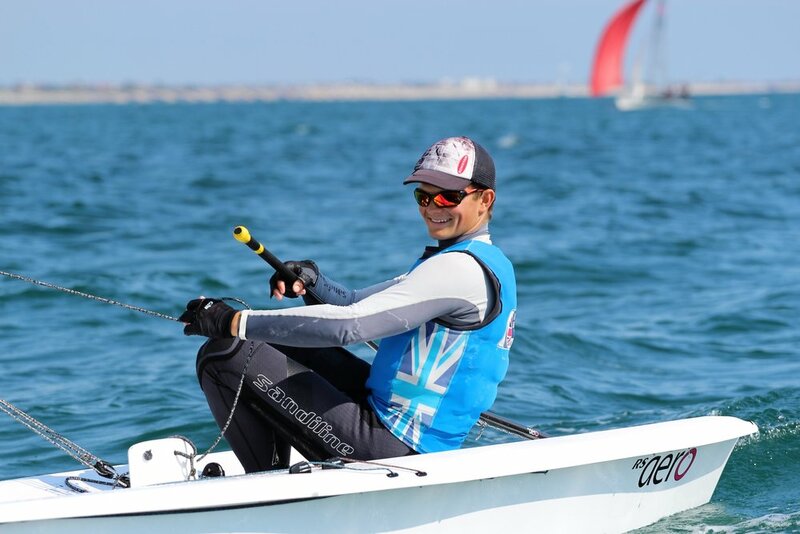 If you're feeling generous it would mean a lot if you might donate towards my Olympic sailing campaign here. Any questions feel free to send me a message on the Contact page here. I am also available for Aero coaching, please visit the Coaching page for more details.